We've traveled the world and had the pleasure of working with many local birding guides. So we can say with some authority that a trip with Erik Bruhnke is much more than just a birding experience. His attention to every detail, his supreme knowledge of birds, and his gentle spirit combined with boundless enthusiasm for all of nature - make a field trip with Erik an absolute joy! We highly recommend Naturally Avian. The cold, the snow, the ice, Lake Superior and Duluth. What a magical place to visit. The trees, the bog, the birds, the Owls and Grouse and Sax-Zim Bog truly amazing. The passion, the knowledge, the care, the connection, Erik Bruhnke, a true inspiration to us all. Erik brought everything together that made our visit come to life. His energy and dedication to birding and Minnesota was a life changing experience for me. I left a better birder, a better person, and I wished I could have stayed longer. THANKS ERIK! I visited the Duluth area in January of 2018 and engaged Erik Bruhnke as my guide. He did a wonderful job over two days of great birding. Working closely with me on my list of target birds, he carefully planned an itinerary that gave us our best prospects of finding the rarities I sought. In that short window, we got multiple Great Gray Owls, Hawk Owls, and Boreal Owls, not to mention a dazzling selection of redpolls, grosbeaks, woodpeckers, finches, nuthatches, grouse, magpies. and others. Client service comes first for Erik, and he made sure we were on the same page with every site and how long we stayed. client comfort and safety are very important to him. Erik is a great ear birder and has a keen eye for spotting well-camouflaged birds., as well as an encyclopedic knowledge of the area's weather, plant life, avian ecology, and mammals. He is also well plugged in with a network of area birders and guides who helped us with real time information on sightings.His excitement on finding a rare bird is contagious. He knows all the famous birding hotspots, and also has an array of lesser-known sites he shared with me. For anyone planning a birding trip to northern Minnesota, I recommend Erik without hesitation. Thank you Erik for an outstanding two days of birding and friendship. If anyone has not had the great pleasure of spending time in Erik's company, I'd highly recommend you do. Erik's vast knowledge and expertise is second to none and his enthusiasm, passion and personable guiding/teaching skills would be valuable to both novice or advanced birders. Erik is a true gentleman in every sense of the word.....The birds become merely a bonus. What a pleasure it is to spend time birding with Erik! He has a marvelous gift both for birding, and for teaching, and he has the excitement and the joy of nature to share in abundance. Our first encounter was at the marvelous Sax-Zim Festival. He knows the area COLD (hahaha) and can find what you are hoping to see. At the Detroit Lakes Festival of Birds in May he morphed into Warbler Man with magical success. If you get the opportunity to bird with Erik, take it! Splendid memories; excellent guide! I was not a birder until Erik Bruhnke got a hold of me. Going on a winter birding trip for a single day to the Sax-Zim Bog was one of the most magical things I did in the outdoors during 2011. I learned so much and felt so incredibly inspired! Having Erik as your guide is the bomb. He is charming, BRILLIANT, enthusiastic, entertaining, kind and helpful. I asked a million questions and had them all answered, and learned things I never dreamed of learning. Run; do not walk to Erik's tours - they are, in a word, life changing. In February of 2012, I had the pleasure and good fortune to hire Birding Guide Erik Bruhnke for my first visit to Minnesota. I was able to see Erik in action the day before our scheduled outing as he was one of a handful of professional guides hired to lead field trips for the Sax-Zim Bog Birding Festival in Meadowlands. His lively narrative of the habitats we visited and the species we saw was very informative and lots of fun. The next day, my friend and I met Erik for our scheduled private tour. Extremely knowledgeable, Erik is passionate about what he does - he really loves finding the birds for his clients! Due to his familiarity with the Duluth area, we were treated in short order to life-looks at ALL of the resident target species we aimed for, as well as several rare migrants Erik knew about at private locations. In short, the day was remarkable! I highly recommend scheduling a trip with Erik. He is a great young guy, gracious host, and wonderful guide. After a day out with him, your head will be filled with knowledge, your eyes will be filled magnificent birds, and your heart will be filled with the joy of a new friend. Erik's in-depth knowledge of the birds and the area are very apparent. He is a terrific reference for planning the trip down to places to eat and take a break. He has a network of sources for up-to-date information and can tailor the trip to your needs. We discussed our goals for each day and Erik was able to spontaneously plan the best route and options to meet those needs, while keeping safety for the birds and birders foremost. We will definitely plan a return trip in another season. In January, 2012, I co-led a group of ten Missouri birders to northern Minnesota. Several of us had birded near Duluth and Two Harbors in winter before (this was my fifth trip); the others others had birded beyond Missouri, but not so far north in winter. We decided a local guide would help us make the most of our time at Sax-Zim Bog, and although we didn’t know him, chose Erik Bruhnke, based on the referral of a Duluth resident we’d birded with before. The whole group had high praise for our day with him. His knowledge of and passion for the bog and vicinity, and for birds and nature in general were evident in the glow in his eyes as he shared the day with us. We had good, long looks at target birds and we learned much about the ecology of the area. After the bog birding, we birded around Duluth, including the harbor (Snowy Owl) and the Hartley Nature Center Park. In addition to his expertise in birding and natural history lore, Erik was especially helpful when one of our group became ill in the evening. His “above and beyond” professional response included transportation to and a stay at a local emergency room well into the night. Our day with Erik Bruhnke revealed many facets of an enthusiastic, knowledgeable, people-skilled, caring person--in short, about as close to the “ideal guide” one could hope for. Erik took my sisters and I on a November birding tour of the Rio Grande Valley which turned out to be the best vacation ever!. We are novice birders from Michigan and were so excited to see the native and migrating birds in that area. His patience with us asking the same questions, very loudly and no less than five times each, was remarkable. He also practiced great restraint as he tried repeatedly to teach us how to take pictures via his scope with our cell phones. His enthusiasm has brought out the inner birder in each of us and slowly we are becoming more aware of the beautiful birds and their habitat in our own surroundings. Thank you Erik! I would go back to the Rio Grande Valley for another tour of yours in a heartbeat. Erik for sharing his talents and special interests with us. Erik Bruhnke presented a lively and entertaining program on northwoods / Sax-Zim Bog birding to the Ben Goss bird club of Waukesha, WI. His talk appealed to a wide variety of interests and levels as evidenced by the enjoyment of my 6 year old daughter to that of experienced veteran birders. Keys to Erik’s success in presenting are his infectious enthusiasm for the natural world and his spectacular photography. Those combined with an intimate knowledge of northwoods birds and wildlife acquired by many years spent outdoors in nature are sure to please any audience. I highly recommend Erik as a speaker to your organization. Erik took me on my first guided birding trip in June of 2012. He provided me with a knowledgeable, enjoyable and safe birding experience. He is also a talented photographer who is willing to share his knowledge of avian photography. I love his energy and friendly demeanor. I highly recommend Erik to anyone wanting to experience the best of birding and photography combined in one outing. Erik loves to teach people about birds, and it shows. He has a vast knowledge of the area and its’ wildlife. Pairing that knowledge with his gentle spirit is a winning combination. He was genuinely happy for us to see our lifer Great Gray Owl. It was a true joy to go birding with him. We highly recommend Erik. He took us to all of the special hotspots around the North Shore, Duluth, and Sax-Zim Bog in the two days we hired him. This is from our heart, and we can’t wait to bird with him again. I very much enjoyed our day of birding with Erik. His obvious love of birds is shown in his enthusiasm for them and breadth of knowledge of Minnesota birds. We had a great birding day with Erik! Not only did we see a wide variety (and number) of birds, we learned good spots to return to on our own. Also, he had great tips for bird identification and future outings. He utilized his fine photography skills to teach us how he identified some birds by showing us photos taken during our outing. As an example, he assisted us in making some measurable forward progress in differentiating gulls by taking photos of various birds we were looking at and then using the pics to clarify pertinent field marks. He was notably skilled at articulating differences in the patterns of flight of various birds and was easy to learn from. Erik was charming and personable with a delightful enthusiasm for birds and ecosystems. Our 10 hours just flew by. An added bonus, we got out of the car often and took a few walks so our backs didn't get stiff. Erik = excellent & enjoyable bird guide! Birding with Erik is a pleasure. He doesn't just know birds he knows habitats. He knows where birds should be based on his knowledge of the species and his first-hand experience in the field. His easy going manner and smile make every birding trip special. Every level of birder can benefit from his expertise. Erik Bruhnke is a talented guide and naturalist. I have birded in small groups with Erik several times. One of the qualities that Erik possesses which makes him a great guide is his genuine joy in being around birds and nature. Nothing is ordinary with Erik. He shares his love of discovery and his enthusiasm makes field trips fun. Erik is an expert birder and naturalist and he is great at helping birders of all skill levels. Guided birding trips can be somewhat of a gamble. However, within the first few minutes of meeting Erik, I knew it was going to be a great day. He was not only knowledgeable about birds and their habitats, but he was enthusiastic about sharing that knowledge. The combination of phenomenal birds and Erik’s personality made my Minnesota birding trip wonderful. By the end of the day, I felt as though I had been birding with a friend. I whole-heartedly recommend a trip with Erik! While in Minnesota in July/August, 2012 for a vacation, I had the opportunity to go on a guided tour with Naturally Avian through the Sax-Zim bog. Thank you, Erik, for a great time and for all your knowledge on the birds we encountered. You made birding fun, entertaining and educational. When I return to Minnesota, I will certainly call upon Naturally Avian for another outing. You will never find a more enthusiastic, upbeat, energetic and handsome guide than Erik. Erik recently gave a presentation to our bird club on the Sax-Zim Bog of northern Minnesota. I have come to expect good photography from avian talks, but Erik’s photos were exceptional. Though truly beautiful, Erik’s photos are not artificially enhanced by software. They are natural and just what you would expect to see in the field. Erik both educates and entertains when he demonstrates the vocalizations of native bog species. But what I found truly different about his presentation is that he gives you clues about the habitat of rare and much sought after bog specialties. Some birds require a specific habitat and Erik shows you what to look for. Even within that special habitat, he points out certain details that will let you know if the bird is active in that vicinity. Very helpful indeed! Erik is a warm and friendly guy—a joy to be with during an exciting adventure into the bog. It's been almost one week since I spent the day birding with Erik and I am still smiling! Erik is extremely knowledgeable and a pure joy to be around, his passion for birds and photography (my two passions) make him the ideal guide. I can't wait for my next trip with Erik! I met Erik during his first year at Hawk Ridge. He impressed everyone (including myself) with his enthusiasm & desire to educate the casual observers to the avid birders, with the fine points of raptor identification and beyond. Erik’s outgoing personality and knowledge about bird identification could set him among the best tour guides in the country. Erik provides a unique and memorable experience for participants in his field trips. Sign up with Erik today to become a more knowledgeable birder! I had grown up in Northern Minnesota, oh so many years ago and this summer I had the privilege of visiting my home state and meeting Erik of Naturally Avian. We enjoyed a wonderful day in Sax-Zim Bog. We were up early, very early, as the early human sees the birds. The bog was breathtaking in the early morning dawn with the fog sitting low to the ground. Erik has the ability to know exactly where the birds are and what species they are even in the fog. In fact, we saw nearly 50 species that day. Just to name a few were the Black-billed Magpie, American Kestrel, Canada Goose, Northern Harrier, Black-billed Cuckoo and many more! Erik is so knowledgeable of all the birds, and we went away having learned so much about the local birds and birding in general. It was such an enjoyable day and all I can say is "Thank you Erik!!" I met Erik at the Festival of Owls and have seen him there for several years. His photographs are wonderful and show that he has a deep love, understanding and appreciation of nature. His enthusiasm is infectious; I am not a gull lover, but through Erik’s many photographs of them, I am able to see they are more than the “flying rats” that I knew from New York’s south shore. Erik is quite talented in other areas too. For the 2011 International Festival of Owls, he baked hand-shaped owl cookies and frosted them with correct color icing! I was impressed. And the cookies were almost too lovely to eat, but I succumbed. And best of all, he is super sociable and a joy to know. I haven’t made it up to Duluth to go birding with him, but it’s on my top 10 list. They sprang from their location to see another matter. Rolled open the windows, and threw up the binoculars. Gave Erik the feel of being in a snow globe. Erik knew in a moment it made the life list. Oh! Wood duck. Wood duck …go home I heard him say. "To the top of the tree! to the top of the feeders! "Now snap away! snap away! pictures without flash!". The beauty of the pine grosbeaks brought tears in a flash. As we hiked to find the great gray owl. And hopefully that great gray owl. 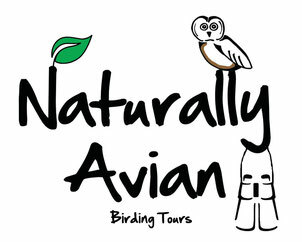 Don’t think twice about booking with Naturally Avian. It was an amazing experience. Day two consisted of gull watching and hiking at Park Point. Never thought I would be outdoors in 4 degree weather watching and learning about Gulls. Erik’s enthusiasm, knowledge, flexibility, and easy going nature made this an awesome experience for the both of us. We loved it so much that we planned a Spring trip immediately.